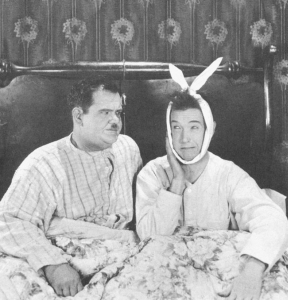 Making new films out of scenes from old ones is an art unto itself, and Laurel and Hardy's methodical pacing is not really ideal for such cut and paste operations. Still, some worthy L&H compilation films have been made over the years. The most famous of these were a series of eye-opening documentaries on silent movie comedy produced by Robert Youngson throughout the 1960s. Those films are included here, along with a few other independent productions along the same lines. Written and Produced by Robert Youngson. Released by DCA/Fox, 1958. A groundbreaking documentary which rekindled public interest in silent comedy, it features scenes from Habeas Corpus, The Second Hundred Years, We Faw Down, The Battle of the Century, Two Tars and You're Darn Tootin', among others. Aside from Laurel and Hardy, THE GOLDEN AGE OF COMEDY paid just tribute to Ben Turpin, Will Rogers, Harry Langdon, Carole Lombard and Jean Harlow. Historians as well and L&H fans owe an eternal debt to Youngson not only for restoring Laurel and Hardy to their rightful place as Comedy Kings (at least for a time), but for rescuing the pie fight sequence from The Battle of the Century. 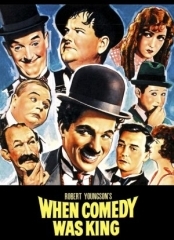 Youngson found the film deteriorating rapidly, and his efforts restored and preserved (albeit in an edited form) a legendary sequence of silent comedy. Written and Produced by Robert Youngson. Released Fox, 1960. Written and Produced by Robert Youngson. Released MGM, 1964. At MGM's behest, Youngson created an overview of the comedy made at the grandest of all studios. The trouble with this film is that although MGM produced some fine comedies over the years, most of the classic comedians featured here did their best work at other studios: Keaton at his own studios, The Marxes and W.C. Fields at Paramount, Abbott and Costello (and Fields again) at Universal, the Three Stooges at Columbia and Laurel and Hardy at Hal Roach. Consequently, most of the scenes chosen to represent these comedians are far from the cream of the crop. Laurel and Hardy are represented by the impromptu dance scene from BONNIE SCOTLAND and the egg-breaking routine from HOLLYWOOD PARTY, both good scenes but neither of which captures the Boys at their absolute best. Written and Produced by Robert Youngson. Released MGM, 1965. A superb compilation of some of Laurel and Hardy's best moments from the silent years, including clips and scenes from Sugar Daddies, Putting Pants on Philip, From Soup to Nuts, Wrong Again, Liberty and many others. Dominated by the title stars, with able support from Roach comedians Charley Chase and Max Davidson. Written and Produced by Robert Youngson. Released by Fox, 1967. 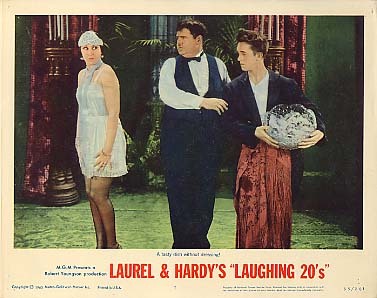 A companion piece to LAUREL AND HARDY'S LAUGHING TWENTIES, THE FURTHER PERILS features an equally fun selection of choice moments from the silent years, highlighted by sections of You're Darn Tootin'. Written and Produced by Robert Youngson. Released by Fox, 1969. The four clowns are Buster Keaton, Charley Chase, Stan Laurel and Oliver Hardy. 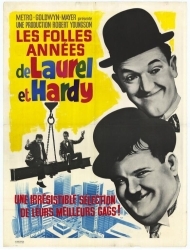 Laurel and Hardy appear in solo scenes, short clips from various silent shorts and a nicely done abridgement of Their Purple Moment. Produced by Hal Roach. Executive producers: Jay Ward and Bill Scott. Released by Joseph Brenner, 1967. With Hal Roach giving them carte blanche to rummage through his films, Jay Ward and Bill Scott (of Rocky and Bullwinkle fame) attempted to create their own Youngson-like film, but with the major emphasis on talkies rather than silents. Even with some new sound effects and music added to occasionally re-edited L&H footage, the boys and their humor survive nicely. Gary Moore narrates, with the films represented including Bacon Grabbers, Beau Hunks, The Music Box, Going Bye-Bye! and THE BOHEMIAN GIRL, among many others. Produced by James L. Wolcott. Not released to theaters, 1971. A British compilation that appeared only on television. 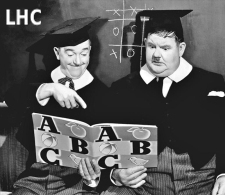 THE BEST OF LAUREL AND HARDY may not be an accurate title, but the film is a representative grab bag of good sequences from many films including Be Big!, County Hospital, Below Zero, Our Wife, PARDON US and OUR RELATIONS. Produced and Directed by Jeff Weinstock and Gene Rosow. Written by Gene Rosow. RHI Entertainment, Inc. 1991. Originally shown on the Disney Channel, this hour long tribute has good points and bad points. Bad points include the use of garishly colorized footage at the expense of the black and white originals, lack of research (host Dom Deluise solemnly states "When Oliver Hardy died in the hospital, Stan Laurel was holding his hand"), and too many pointless quotes from celebrities. Good points include Laurel and Hardy themselves, who are shown in a wide ranging selection of good to great scenes. Johnny Carson's thoughts on the Boys onscreen friendship and Hardy's camera looks are revealing, and Walter Matthau contributes a memorable quote: "I always enjoyed Laurel and Hardy. I don't know why - maybe because I'm stupid!"